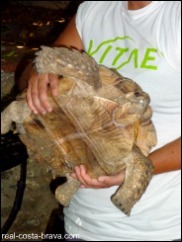 Looking for things to do (other than lying on the beach) whilst on the Costa Brava, we recommend visiting a tortoise! 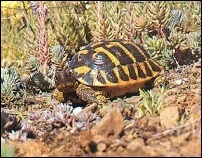 In the Albera range, the most easterly stretch of the Pyrenees, lives the last natural population of critically endangered Mediterranean Tortoise (Testudo hermanni hermanni) of the Iberian Peninsula. The Albera Range was designated a Natural Park in 1986 in order to protect the last population of these lovely animals. At the Tortoise Centre, which is managed by the Albera Friends of the Tortoise (ATA), these tortoises are bred to increase the natural population, study their biology and ecology and to educate the public about the need to protect and conserve these fabulous creatures. The centre has a resident population of Hermann’s tortoises and other varieties of tortoises that have been donated by private owners and so have always been kept in captivity. As a result they are not at all afraid of people and so they don’t duck back into their shells when you get close. The Hermann's tortoises breed and the new tortoises are then released into the wild. As well as being released into the Albera range, the Mediterranean Tortoises from the centre are also being introduced into other areas of Catalonia (Cap de Creus Natural Park, Garraf Natural Park, Ebro Delta Natural Park). We were very lucky when we visited the Tortoise Centre, that they were measuring some of the large donated adults and giving them a health check. The tortoises were so used to people that they weren’t in the least bit perturbed by being manhandled. I bent down to take a picture of one of them who was walking surprisingly fast towards me (I had no idea that tortoises could move that fast) and he walked right up to the camera and then over my foot, on his way to an exciting looking plant. It was just fantastic to get so close to such a brilliant animal. The tortoise centre also has a few other varieties of tortoise and terrapin in separate enclosures. But my favourite thing at the Tortoise Centre is the new hatchlings. They are kept in an incubator in the museum/information office. They are so small they don’t look real. The centre looks like an old hacienda and is in a lovely location at the foot of the Albera Range, next to the pretty little church of Mare de Deu del Camp (accessed from the courtyard of the centre). There is also a donkey stables next door where you can go for a donkey ride or just have a stroke. After you have visited the centre, we strongly recommend a drive into the stunning Albera Range seeing as you are so close. 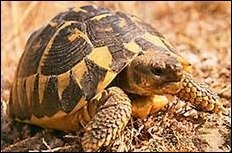 Please support the Tortoise Centre to help the tortoises survive. 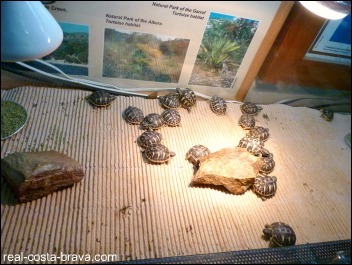 The entrance fees go towards the maintenance of the centre and projects to conserve the Mediterranean Tortoise. 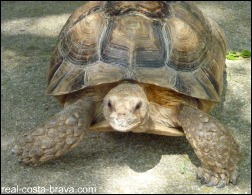 There is an information centre, a small museum with a video about tortoises in Catalan, English and French, tortoise enclosures (some with exotic species) accessed via a raised boardwalk. Also, next door is a donkey stables and a small church. The centre is 500m from Garriguella on the road to Vilamaniscle. 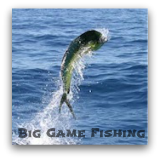 It is signposted from Garriguella. Zoom in on Vilajuiga and then on Garriguella on the map below to see the numbers and names of the roads. The nearest motorway is the AP7. You can get to Garriguella and Vilamaniscle by bus from Figueres ampurdanbus.com. The nearest train station is Vilajuiga (approx 3km away). 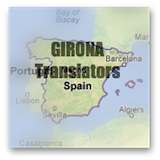 Please see for details (you have to click on the 'find all stations' button and manually find Vilajuiga, as for some reason the website doesn't list it in the drop down menu).